Brussels Sprouts are a type of vegetable related to the cabbage family. The edible portion of this vegetable is the leafy bud or small cabbage-like head which grows in the axils of each leaf. The tops of the vegetable are sometimes used as salad greens. 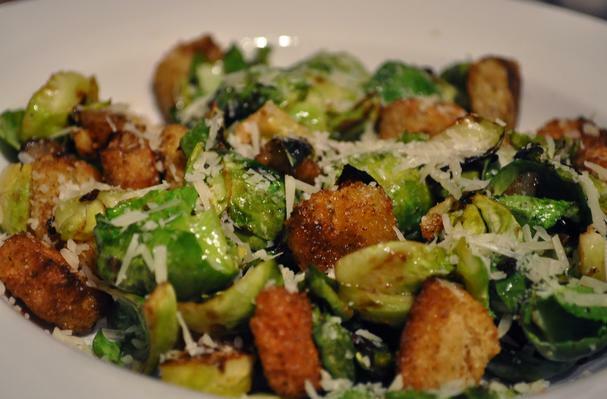 Brussels Sprouts provide an excellent source of Vitamins A and C, dietary fiber and folic acid. Part of the Brassica family, which includes broccoli, kale, collard greens, cabbage, etc), brussel sprouts contain a high content of sulfur-containing phytonutrients, believed to help fight cancer according to nutritionists. When preparing Brussels Sprouts, first trim off the bottom of each sprout and then peel off any discolored leaves. This vegetable can be boiled, roasted or steamed and eaten alone or mixed with other vegetables. Brussel Sprouts are a member of the cabbage family and resemble a small cabbage they are dark green with small outer leaves similar to the cabbage. Choosing: Most stores carry Brussels Sprouts year round but in the late summer they will have fresh Brussels. When choosing take the smallest ones they are the most tender and will have the best flavor. Buying: Brussels Sprouts can be bought in a variety of ways they come frozen either cooked and seasoned, frozen not cooked or seasoned, and fresh which are the best with the best flavor. You can find them late in the summer early fall at farmer's markets. Procuring: Brussels Sprouts can be grown in climates where there is a long growing season they need cooler temperatures and require about 90 days to maturity. They don't do well in hot weather and can become bitter and bug infested. The best time to plant is when you plant cabbages in late spring or early summer and in colder climates they can produce up to a hard frost.. Most stores carry Brussels Sprouts year round but in the late summer they will have fresh Brussels. When choosing take the smallest ones they are the most tender and will have the best flavor. Cleaning: Wash thoroughly a few times the best way is to soak them in a little salted water overnight to remove all dirt or bugs. Remove the smaller outside leaves to reveal the tender buds inside. Brussels will keep for a long time in your crisper they have a long shelf life similar to cabbage. After cleaning store in zip lock bag and be sure to remove all the air. They also can be frozen after blanching for winter use.